Let me tell you why God made the world. One afternoon, before anything was made, God the Father, God the Son and God the Holy Ghost sat around in the unity of their Godhead discussing one of the Father’s fixations. From all eternity, it seems he had had this thing about being. He would keep thinking up all kinds of unnecessary things—new ways of being and new kinds of beings to be. And as they talked, God the Son suddenly said, “Really, this is absolutely great stuff. Why don’t I go out and mix us up a batch?” And God the Holy Ghost said, “Terrific, I’ll help you.” So they all pitched in, and after supper that night, the Son and the Holy Ghost put on this tremendous show of being for the Father. It was full of water and light and frogs; pine cones kept dropping all over the place and crazy fish swam around in the wineglasses. There were mushrooms and grapes, horseradishes and tigers—and men and women everywhere to taste them, to juggle them, to join them and to love them. And God the Father looked at the whole wild party and he said, “Wonderful! Just what I had in mind! Tov! Tov! Tov!”* And all God the Son and God the Holy Ghost could think of to say was the same thing. “Tov! Tov! Tov!” So they shouted together “Tov meod!”^ and they laughed for ages and ages, saying things like how great it was for things to be, and how clever of the Father to think of the idea, and how kind of the Son to go to all that trouble putting it together, and how considerate of the Spirit to spend so much time directing and choreographing. And forever and ever they told old jokes, and the Father and the Son drank their wine in unitate Spiritus Sancti,+ and they all threw ripe olives and pickled mushrooms at each other per omnia saecula saeulorum %. Amen. It is, I grant you, a crass analogy; but crass analogies are the safest. Everybody knows that God is not three old men throwing olives at each other. Not everyone, I’m afraid, is equally clear that God is not a cosmic force or a principle of being or any other dish of celestial blancmange we might choose to call him. Accordingly, I give you the central truth that creation is the result of a Trinitarian bash, and leave the details of the analogy to sort themselves out as best they can. One slight elucidation, however. It is very easy, when talking about creation, to conceive of God’s part in it as simply getting the ball rolling—as if he were a kind of divine billiard cue, after whose action inexorable laws took over and excused him from further involvement with the balls. But that won’t work. This world is fundamentally unnecessary. Nothing has to be. It needs a creator, not only for its beginning, but for every moment of its being. Accordingly, the Trinitarian bash doesn’t really come before creation; what actually happens is that all of creation, from start to finish, occurs within the bash—that the raucousness of the divine party is simultaneous with the being of everything that ever was or will be. If you like paradoxes, it means that God is the eternal contemporary of all of the events and beings in time. #The book is out of print but still available as part of a trilogy, The Romance of the Word: One Man’s Love Affair With Theology : Three Books : An Offering of Uncles/the Third Peacock/Hunting the Divine Fox. *Tov is "good" in Hebrew. ^"Abundant good" or "very good." +In the unity of the Holy Spirit. Matthew 26:7-16, Mark 14:3-11, John 12:1-8, and Luke7:36-50. In these descriptions of four very similar events, we see that John emphasizes the fact that Mary was at the feet of Jesus. On the other hand, Matthew and Mark emphasize the anointing of Jesus' head as with the anointing of a king. Most scholars agree that Luke describes a different event with a different woman. I can imagine a conversation between Matthew, Mark, Luke, and John in heaven. Matthew says to John, "Hey I really like what you did with your account of Mary anointing Jesus." "Oh yeah, thanks, you know how it is, inspiration of the Holy Spirit." Mark chimes in with, "Yeah, John, but you really emphasized the bit about Mary always being at the feet of Jesus. I wish I had thought of that. We all saw her anoint his head but you also brought out her humility in stooping down, anointing his feet, and wiping them with her hair." John replies, "Yeah, I guess that is how I always saw her. She was at Jesus' feet when he was teaching. She fell at his feet when he came to raise Lazarus. And then she poured perfume on his feet and made quite a spectacle of herself with her long hair." At which point, Luke breaks into the conversation and says, "Yeah, she looked a lot like that other woman who wiped Jesus' feet with her tears. I mentioned her in my gospel record, you know." Matthew, Mark, and John chuckle at the doctor and Mark says, "Yeah, good connection Luke." John adds, "All those feelings of unworthiness and sorrow wrapped up in both of those events." Matthew looks over at the Holy Spirit and says, "Wow, talk about divine inspiration!" 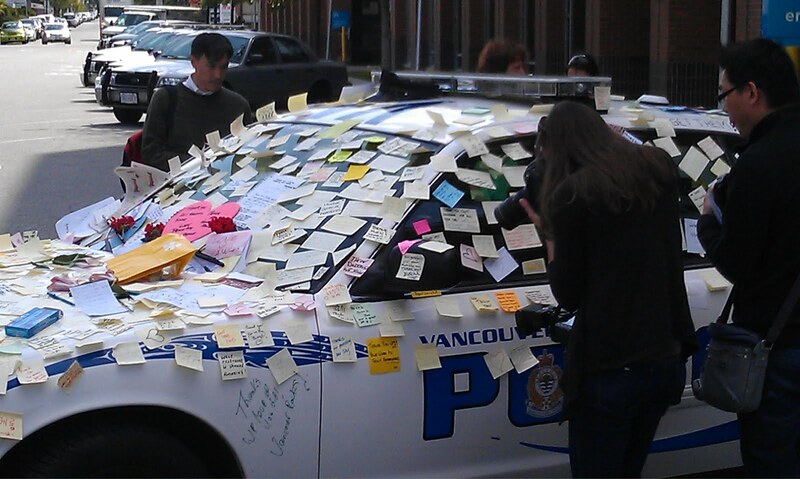 Notes of appreciation to the Vancouver Police from the people of Vancouver. I am a mixture of emotions today. I am very happy that the Vancouver Canucks Hockey team gave us such a great season of entertainment. I am thankful that I get to live in the great city of Vancouver. Yes, I did want to celebrate a Stanley Cup victory with my friends in this city or celebrate a great second place showing. I remember other good celebrations where people cheered and spontaneously sang "Oh Canada" on the balconies and streets of downtown Vancouver. I wanted to wave across the street at my neighbours and have them feel joy. I am sad that anarchists and other people with empty lives have hurt the image of Vancouver. People who think that rioting, or hockey, or alcohol , or marijuana will fill their lives are sadly lost. They do not realize that they have a "God-shaped-hole"# in their lives that is aching to be filled. A few hours before the hockey game started last night I was thinking about these words by Dallas Willard: "Feelings are, with a few exceptions, good servants. But they are disastrous masters. "* I thought about how many people in Vancouver needed to put a little emotional distance between themselves and the Canucks so that they would avoid being ruled by their emotions. The rioting in Vancouver last night had little to do with hockey but it did have a lot to do with people being ruled by emotions. #Blaise Pascal coined this concept and C.S. Lewis made it popular. Using the right tool for a task is important. A small screwdriver and a pair of forceps are the right tools for opening up my computer. They work better than an axe . . . especially if I want to be able to close up the computer and use it again. Mathematics is a great tool for describing difficult concepts in physics. In fact much of what is presently being investigated in the area of particle physics can only be described by mathematics. Once a concept is worked out in mathematics it may lead to physical experiments that attempt to prove or disprove a theory. For such experiments one would need another set of tools like a Large Hadron Collider and experimental science. Math and science contribute much to our understanding of the world but they are poor tools for investigating God. They are good tools for investigating how our universe operates but they are poor tools for answering the question of why things exist. Philosophy and theology use tools of logical discourse and thought experiments to investigate things that are beyond the limits of mathematics and empirical sciences. These tools are well suited to the analysis of questions of origin, ultimate reality, and God. They also require faith. We must not fear math and science but we also need not fear belief and faith. They are all tools which, when used appropriately, are well suited to the investigation of reality. *Collins, Francis S. The Language of God: A Scientist Presents Evidence for Belief. New York: Free Press, A Division of Simon & Schuster Inc., 2006, p. 30. In light of recent controversies about hell, I found these words by C.S. Lewis, in his book, The Great Divorce, to be rather helpful. *Lewis, C.S. The Great Divorce (fourteenth edition). Glasgow: William Collins Sons & Co. Ltd., 1983, p. 66, 67.